Well, just wanted to say thank you. Best tutorial as far as I know on RoR. See you on twitter. Amazing book, it explains the concepts clearly and illustrates them with powerful examples, I have taken rails tutorials before, but this book gave me the basis to fully understand and be able to code in rails effortlessly. I love it. I now have rails fundamentals down. We have many experiences about developing websites with PHP, but recently by request from customers, we started a team to play with Ruby on Rails technology. It's very fun & easy to create website after we found your tutorial on the web. With fundamental knowledge we had before, we can master Ruby on Rails for production in short time (about a week). Thank you very much, Michael Hartl! 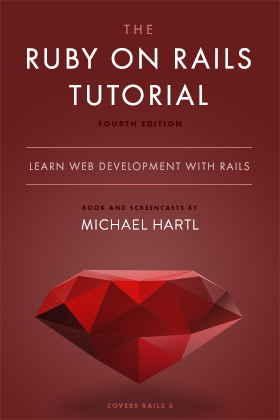 Michael Hartl's tutorial is a fundamental element in getting going with Rails. Creating a great tutorial is a feat in an of itself, keeping it updated is really great. I highly recommend anyone starting out (or even refreshing their knowledge) with Rails to get their hands on this tutorial and follow it through. If you are just starting your first steps into the ruby on rails world you must read this book. It takes you 'literally' step for step from a "Hello World!" app into a completely functional production website. The level of detailed steps and explanations will simply prevent you from feeling lost anywhere. Even git and heroku commands are repeated each time you use them, which saved me as a beginner a lot of time and frustration. I enjoyed reading the book the first time, and now I am going through it another time. The best practical rails tutorial out there! I've been trying to learn rails for a year now and it is just about sinking in. This book along with the screen casts was by far one of the best resources i used. You learn practically how to build an rails app like you were an actual developer. After finishing i had the confidence to build my own after, i didn't have this with some of the books that i worked through. Great book. It s hard to find a training as thorough and complete as this one. I know that learning should be easy but sometimes it is difficult to learn IF the training is not as good as you expected. You have no such thing as this. This is by far the best training. You learn web development like no other site will claim. It s easy to follow and you cannot miss it. Amazing book. First RoR book or course that I was able to finish. Wrote with a ton of clarity, I would highly recommend it. I started learning Java at my local college and wanted to learn Ruby on a friend's advice. I couldn't be happier. This is really a great learning tool. Michael does a really good job of teaching Rails by creating a deep, almost-production-ready application, complete with many features and concepts that virtually every Rails app needs to consider--not only users and login, but email verification, password recovery and reset, and security. The Ruby on Rails Tutorial doesn't make any assumptions about the technical experience of the reader, giving great explanations of new concepts, and when appropriate, pointing the reader to additional online resources about various topics. I strongly recommend this book for anyone looking for a deep introduction to Rails. An already great book, even better up to date. A different take on what could be a dry manual, as different as Tau is to Pi. I have checked tons of tutorials and books online and this one is definetely the best book i have read so far. It teaches advance topics with easy to follow parts and gives you solid foundation to jump to more advance topics. I strongly advice you to check learnenough.com where you can find other tutorials by Michael , which are as useful as this book, and check other peoples answers on chapter questions to increase your understanding of the topic. I always go back to this book to check some piece of code or a topic which i forgot after a period of time. Pros: I loved that I could follow the book with much ease. It was nice that it included testing. As a aspiring developer it's easy to get a little stuck trying to progress through what is often well documented but strange, unfamiliar terrain with maze like properties.. I have a plan,  and idea that I think is pretty snazzy and Im teaching myself, the onus is on me to priorities learning and fill skills deficits in the face of different versions opinions and my own capacity to manage all the information and my own expectations. The Rails tutorials specifically the establishing of a development environment has been really key to my momentum and as a result moral and motivation. If you are new to all of this the Rails tutorials along with the 'learn enough' bite sized lesson are a great place to build knowledge and confidence. Mich’s method is potentially a breakthrough in learning which should be adapted and improved upon in all realms of learning. It’s simply sublime! Ruby on Rails Tutorial teach you anything about command line, ROR, Git, Heroku.... Thanks Michael Hartl! Acquistato il miglior tutorial aggiornato alla versione 5 di Ruby on Rails.